The Metro Beekeepers Association (“MBA”) is organized to educate its members, and the general public of the importance of bees to horticulture and the environment. We provide education about the best methods of beekeeping and honey production. We promote beekeeping in urban areas, as well as, attracting and training future beekeepers in the science, and craft of beekeeping. Membership is open to the public and consists primarily of amateur beekeepers and others not professionally connected with beekeeping or commercial honey production. Our meetings take place on the second Monday of every month. This month we will have Bruce Wallace coming all the way from Australia to talk to us about Small Hive Beetles and his product, the Beetle Buster small hive beetle trap. Raffle Tickets: Proceeds benefit the Youth Scholarship Program. Bring a snack or drink for break time and receive ONE raffle ticket. Bring an item for the raffle and receive FIVE raffle tickets. Raffle items are not limited to beekeeping items. Raffle tickets are also available for purchase: ONE ticket for $1.00 or SIX tickets for $5.00. Bee Removal Permit - please make sure to submit your Bee Removal Permits if you have not done so for this year. If we do not have your permit copy please send one to us or bring a copy to the meeting so that our website and files can be current. Click to learn more and sign-up! ** Sign up for the 2019 Beekeeping Class- Beekeeping Class begins at 5:30 p.m. The 11 class program is January-November. Class is $125 and includes a course text book. 2. 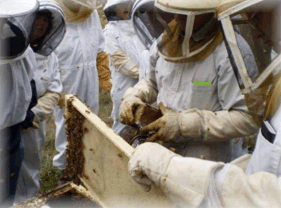 The focus of the course is education about bee keeping. 3. Course costs are $125, paid in cash or check. This cost is per person. 4. We meet the SECOND Monday of each month (January-November) from 5:30p to 6:25p at the Southside Preservation Hall in Fort Worth (1519 Lipscomb St Forth Worth, Texas 76104). 5. Instructional focus includes: bee biology and behaviors, beekeeping equipment options, hands on opportunities to work in a bee yard, and the best practices in beekeeping. In addition, we will look at many pictures and see ways to effectively manage bees. There will be ample opportunities to ask questions and observe experienced beekeepers in action. Guests are welcome to attend. Members are asked to occasionally bring a snacks or drinks to share during break. You can browse the bee-related vendors during the break. Earn One door prize ticket, when you bring a food/snack/drink item to share during the meeting break. Earn five door prize tickets, if you donate a door prize item. Door prize tickets are available at the door; one (1) ticket is $5, or five (5) for $20. All money supports the youth scholarship program. Some restrictions apply to the donated item. Hope to see you there!